Being a responsible aquarist, you should be aware that there are several methods you can choose from to accurately measure pH and other important parameters of your fish aquarium tank. Water testing kits are available in paper and liquid forms as well as the more expensive electronic pH meter. Compared to paper test kits, many aquarists choose to use liquid tests because of its apparent sensitivity and accuracy. The electronic pH meter is the least popular among these methods because of its price. Aside from water pH, there are several factors that should also be regularly monitored for they can equally influence water quality of fish aquarium tanks. For convenience, these parameters can easily be tested using multi-test kits which are designed to measure pH, ammonia, nitrite, and water hardness using a single water sample. Liquid water test kits come with one or more dyes that can change color to denote specific pH levels and other water parameters. You add a dye mixture to a water sample that you have obtained from your aquarium. To determine the results, the color of the solution is then matched to a color reference chart that also comes with your water testing kit. There are pH test kits which are indicated for a narrow pH range thus make sure to verify the indicated pH range of the test kit before you buy one. For example, a pH kit designed for freshwater tests may be only useful for a pH range of 5-7. 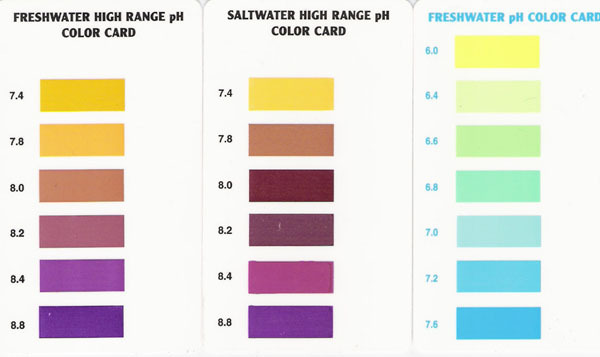 For saltwater, you have to look for a pH test kit that is indicated for a pH of 8.2. In order to get the best results out of your pH test kit, be sure to follow directions to the letter. One of the most simple and affordable methods to use in monitoring water pH in an aquarium is the API Phosphate Test Kit. It is a liquid formula which can be conveniently used in freshwater and saltwater media. Phosphate is a common chemical that may be present in aquarium water. The build-up of phosphate lowers water quality thus affecting the wholesomeness of the aquarium environment. When phosphate is present in high concentrations, it often means there is a high level of decaying organic matter. Excess amounts of waste materials can pollute the aquarium water and eventually result in a shift to an acidic pH. Directions on using the API Phosphate Test Kit are outlined below. 1. Fill a clean test tube with 5 ml of water to be tested (to the line on the tube). 2. Add 3 drops of pH Test Solution, holding dropper bottle upside down in a completely vertical position to assure uniformity of drops. 3. Cap the test tube and invert tube several times to mix solution. 4. Read the test results by comparing the color of the solution to the pH Color Card. The tube should be viewed in a well-lit area against the white area of the card. The closest match indicates the pH of the water sample. Rinse the test tube with clean water after use. Another test kit which has garnered popular following among aquarists is the API Freshwater Mini pH test kit. The kit is designed to test pH levels that range from 6.0 to 7.6. It comes bundled with 250 tests thus giving you unequaled value for your money! If you choose to go for ultimate convenience in pH monitoring and adjustment, many aquarists rely on API Deluxe P.H. Test Kit with Liquid Adjusters—a two-in-one kit that is already equipped to measure and adjust water pH to desired levels. The kit is perfect for pH levels that range from 6.0-7.0.